You forgot the bug spray. And you scratched and scratched. Now, you’re paying the price. Our expert explains the signs of infected mosquito bites — and what to do about them. “Stop scratching!” That’s good advice, of course. But sometimes it’s easier said than done. Seemingly blissful summer evenings happen. Sitting outside, without a care. No mosquito spray, citronella candles, long sleeves or pants — big oops! So what do you do the next day (or even day after) when the welt(s) from the unintended mosquito fest seem out of control? 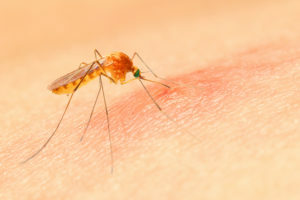 Cleveland Clinic family nurse practitioner Allison Folger, CNP, says mosquito bites are simply a nuisance for many but explains they can get infected if you don’t leave them be. The infection’s not the mosquito’s fault! “If you or a child has these signs of infection, it is important to see your doctor,” Folger says. One easy way to tell if the bite is spreading? Take a pen and draw an outline around the mosquito bite. That’s a fool-proof, objective way to keep an eye on it. If your doctor confirms it’s cellulitis, you’ll need a round of antibiotics to kill the bacteria (typically strep (streptococcus) or staph (staphylococcus). How to treat it in the meantime? If you’ve got a mandarin orange-sized welt that you’re worried about, here’s the best way to treat it: Folger recommends cleaning the bite with soap and water, and then applying an over-the-counter hydrocortizone cream. This will help reduce the swelling and itching. If desired, this can be followed with calamine lotion, which contains a mild topical anesthetic that may ease the discomfort. “Use ice packs on the area to help bring the inflammation down, and reapply the topical medication every four hours,” she recommends. Your healthcare provider may also recommend using an oral antihistamine (such as Benadryl®), as they’re more effective at providing relief than topical creams. Infected or just a itchy aggravation? You’ll probably be fine soon with proper care either way, Folger says. And getting bitten so badly may just remind you to take an ounce of prevention next time.